A robot made our dinner at Yo! Week two of the summer holidays, and if you're already struggling for things to do, check out this list of fun activities in North London. And one to add - we've just come back from an unexpectedly entertaining restaurant meal! We eat out a lot - a combo of being a foodie family and the exciting opportunity of *not* having to sweep my kitchen floor 2.3 million times a day when one meal's mess is swept away by a restaurant's broom instead. And we've just had such a brilliant meal at YO! Sushi. It seems to have had a rebrand - and the menu was a lot more wide-ranging than the last time I visited too. I loved the bao. But this trip wasn't about me. The food was affordable and tasty - we grown-ups polished off furikake fries, nigiri, and tempura veg as well as sushi; a couple of the dishes lacked the zing you find at homegrown Japanese rivals, but all were fresh and most was delicious. What really stood out, though, was tiny man's face. A robot restaurant. 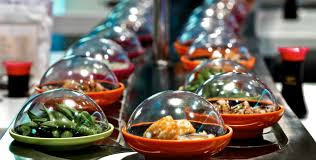 The food grabbable from speeding conveyor belts. Water came out of robotic taps at your seat. Food went round rings *without grown-ups intervening*. Tiny man's eyes were boggling. He couldn't stop beaming. Or grabbing dishes, actually, so we ate a whole lot of edamame and maki platters! For kids, especially, Yo! 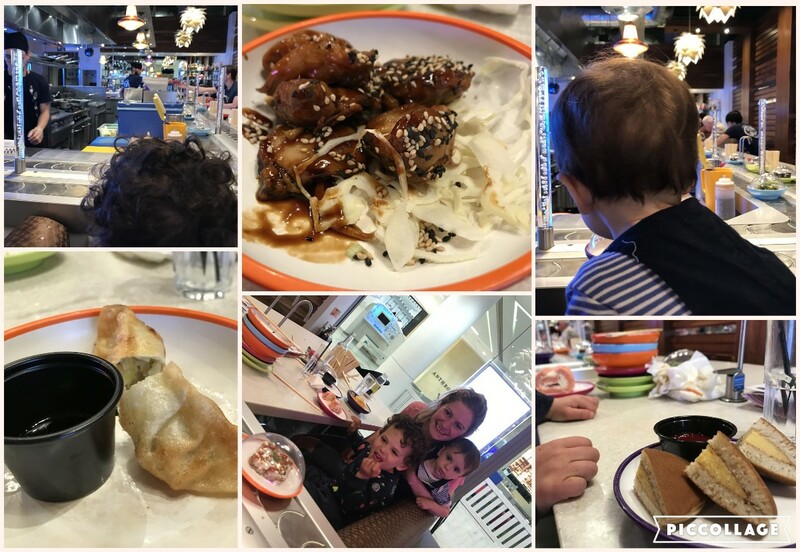 is really reasonable: the £5.95 Mini Ninja deal includes a starter (avocado or salmon maki) and main course (yakisoba noodles and the mild chicken katsu curry went down well with both tiny man and his just-turned-one brother), plus a drink. Even though we ordered the food from the kids' menu from a waiter, the super kid-friendly chef in the middle of the restaurant (we went to the Brent Cross branch) was sure to show tiny man how he cooked his meal, then put it on the conveyor for it to whizz over - "LOOK MAMA A ROBOT IS BRINGING MY DINNER!" Desserts were another £1.50, including Gooey Chocolate Pots and fresh fruit plates, but we went for dorayaki pancakes a la Japan. * Thanks to Yo! for inviting us to try their new Mini Ninja deal; we're seriously gobby and only rave about things we really love.